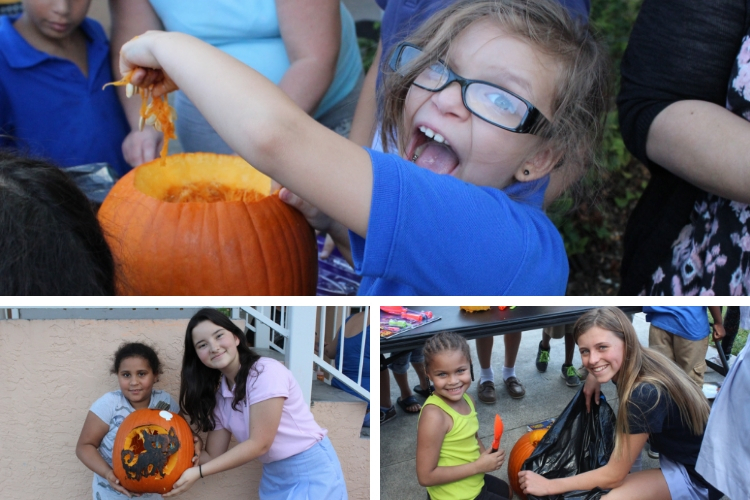 October 30, 2018, West Palm Beach, Florida – For the seventh consecutive year, Rosarian Academy students were blessed to spend a few hours on October 24 carving pumpkins and making new friends with the children who reside at The Lord's Place Family Campus. Members of Rosarian’s National Junior Honor Society organized the Halloween activities, including (pumpkin) guts and lots of glory. The Rosarian students paired with children who are housed by The Lord’s Place to carve and paint pumpkins, share stories, and have fun together. Through a school-wide effort, more than 60 pumpkins were collected. The Lord’s Place Housing Programs provide shelter for homeless men, women, and children and help residents identify the issues that led to their homelessness. The Lord’s Place gives its residents the tools they need to stabilize their lives, while providing safe homes so they can thrive. Currently, 36 families with 60 children reside at the Family Campus. Rosarian Academy, founded in 1925, educates students from early childhood through eighth grade and offers an exceptionally strong academic program enriched by athletics, visual and performing arts, and community service opportunities. The independent, Catholic school is located in West Palm Beach and is sponsored by the Adrian Dominican Sisters. From top: A child experiences the glory of pulling out pumpkin guts. Eighth-grader Parker Ward is all smiles a she carves a pumpkin with her partner from The Lord’s Place. Eighth-grader Olivia Klein and her partner show off their detailed cat creation.